Description: This handbook provides a practical guide for the student and scholar alike who wishes to use the Septuagint (LXX) in the text-critical analysis of the Hebrew Bible. It does not serve as another theoretical introduction to the LXX, but it provides all the practical background information needed for the integration of the LXX in biblical studies. The LXX, together with the Masoretic Text and several Qumran scrolls, remains the most significant source of information for the study of ancient Scripture, but it is written in Greek, and many technical details need to be taken into consideration when using this tool. Therefore, a practical handbook such as this is needed for the integration of the Greek translation in the study of the Hebrew Bible. 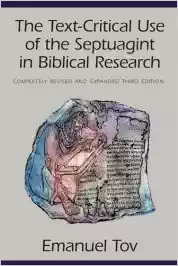 The Text-Critical Use of the Septuagint in Biblical Research is based on much background information, intuition and experience, clear thinking, and a solid description of the procedures followed. The author presents his handbook after half a century of study of the Septuagint, four decades of specialized teaching experience, and involvement in several research projects focusing on the relation between the Hebrew and Greek Bibles. The first two editions of this handbook, published by Simor of Jerusalem (Jerusalem Biblical Studies 3  and 8 ), received much praise but have been out of print for a considerable period. This third edition presents a completely revised version of the previous editions based on the many developments that have taken place in the analysis of the Septuagint, the Hebrew Bible, and the Qumran Scrolls. Much new information has also been added. Citation: Leonard J. Greenspoon, review of Emanuel Tov, The Text-Critical Use of the Septuagint in Biblical Research, Review of Biblical Literature [http://www.bookreviews.org] (2016).